To send an email in windows live mail the first thing you need to do is to create a new email message. Click on the email message icon (top left) or enter CTRL +N . Enter the email addresses in the to line. You can enter multiple email addresses by using a semi colon to separate the addresses. 1 If you already have contacts in your address book then as you type you may see name suggestions appear below the address. If the one you want is shown click it to add it. 2. 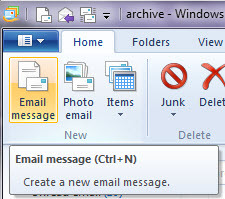 If Windows live mail recognises an email address it will substitute the display name from the address book. 3. You can access the address book by clicking on the to link. 4. If you need the cc and bcc fields then click the cc and bcc link on the right . 5. All messages should have a subject otherwise they may be treated as spam -so enter a subject . 6. Windows live mail will use HTML emails by default. HTML emails allow you to use different fonts,colours,images,links etc just as you would find on a web page. 7. You can switch to plain text by clicking on the plain text icon but you should only do so if you really need to send in plain text. 8. Windows live mail has a built in spell checker which will underline any spelling mistakes as you type. 9. Message priorities do not speed up your email message. 10. Requesting a Read receipt doesn’t mean that you will get one as it depends on the recipient email settings. When adding file attachments don’t add really big files (>10MB) as they may be blocked. You should also be aware that many email providers will block attachments with certain file extensions like .exe files because of viruses. To send picture attachements there are a few quirks .See sending pictures using WLM. To send working links by email the email needs to be formatted in HTML mode (default). To add the link using the Add link icon and enter the link text and url in the window. or use your browser to open the page you want to link to, and copy and paste the url into your message. If you send email to multiple recipients it is very important that you understand how to use the to, cc and bcc fields correctly. Generally there should be only one address on the to line. The cc line is normally used for all other addresses. The bcc (blind carbon copy) line is used if you don’t want other recipients to know who the email was sent to. This is common with mailing lists. You should also note that most providers will impose a limit on the maximum number of recipients that you can send to (usually 50-100) at one time. If you frequently send to a group of people then create a mailing group/distribution list. By default all of your sent emails are stored in your sent items folder. 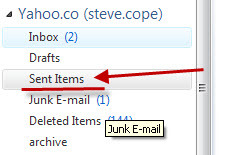 If you are using Windows Live Mail with a POP3 mailbox then the sent items folder is stored on your Email Client. If you are using Windows Live Mail with a IMAP4 mailbox then the sent items folder is stored on your Email Server.